Kyle Busch holds off older brother Kurt at Bristol for his eighth NASCAR Cup victory at the track. 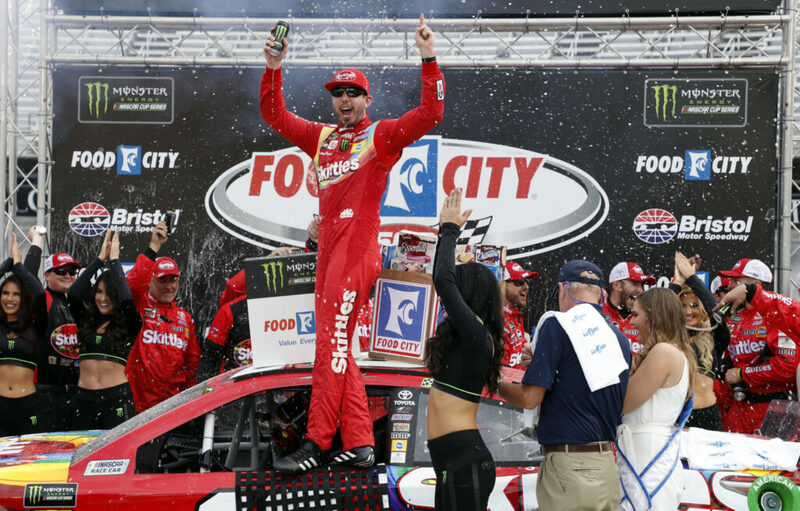 Busch grabbed his third Cup win of the season, eighth overall at Bristol, and 10th this year spanning all three of NASCAR’s national series. The victory Sunday came at the expense of his older brother, who lined up right beside him on the final restart but couldn’t slow Busch’s steamrolling of the competition this year. The Busch Brothers were first in line not to pit for tires during the 11th caution to set up a final shootout between Bristol’s two winningest active drivers. Kurt Busch is a six-time winner at the .533-mile high-banked oval and lamented over the P.A. system that he should have wrecked his brother for the win. The crowd roared and affirmed Kurt Busch’s frustration with the final results. Kyle Busch seems to win all the time this season, in anything he drives. Along with teammate Denny Hamlin, they’ve given Joe Gibbs Racing five wins through the first eight races. If a Gibbs car doesn’t win, then a Ford from Team Penske will – that organization has the other three Cup victories this year. And the win was probably going to go to either Penske driver Brad Keselowski or Joey Logano until a late caution forced teams to gamble and go in for tires or stay on track and try to maintain their track position for the final 14 laps. The leaders – Logano and Keselowski – went to pit road, while Busch and his big brother moved to the front of the field. It set up the storybook ending on a weekend the entire sport honored Hall of Famer Darrell Waltrip, the all-time winningest driver at Bristol with 12 victories. He used this venue to announce he’ll retire as Fox Sports’ lead analyst after 19 seasons, and his success at making this concrete jungle his playground was celebrated as Waltrip waved the green flag to start the race and was wired by the network to give his trademark “Boogity! Boogity! Boogity! Let’s go racing, boys!” call from the flagstand. But what was once Waltrip’s domain now belongs to Kyle Busch, and not much can stop him these days, especially at Bristol. Fitting, then, that he found himself out front in an entertaining, old-fashioned Bristol barn burner. “It ain’t 12, that’s for sure. So I got more to go. We’re getting there and it’s fun,” Kyle Busch said. Kevin Harvick’s car failed inspection three times before the start of the race to draw race-crippling penalties. NASCAR ejected his engineer from the event, and forced Harvick to give up his 13th-place starting spot, drop to the back of the field and serve a pass-thru penalty at the start. It was certain to drop him several laps behind the leader immediately, but a caution on the second lap of the race as Harvick was on pit road mitigated the damage. Harvick had myriad issues during the race and at one point dropped four laps behind the leader, but he had scrambled to the lead lap for the final restart and managed to finish 13th – exactly where he would have started if his car had not failed inspection. Aric Almirola’s race lasted just two laps before William Byron wiggled into him and sent Almirola’s car into the wall. The damage ensured him a last-place finish after starting sixth. Almirola chalked the incident up to second-year Cup driver Byron’s inexperience and potential “panic” when cars began to pass him at the start of the race. Byron started second on the front row.